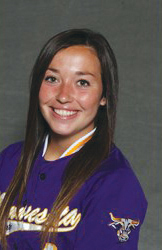 Standing on the mound wearing a number one jersey for the Maverick women’s softball team is Coley Ries. Ries is in her third year playing at MSU but has been playing competitively since she was eight and was tossing a baseball around as soon as she could. Ries journey to the Mavericks hasn’t been a solo one. In her first year traveling to play the game she was going to be cut but ended up on developmental team with her eventual fellow Mav teammate Karli Deslauriers and other players that didn’t make the cut. It is clear now that a minor setback such as that wouldn’t deter Ries from continuing to pursue her passion. She continued playing and has gone on to be starter and letter winner in high school playing for Mankato East. Some of her favorite pre-college memories of playing happened in high school as she cited. Ries exited high school with all conference, All-State, all-selection, and All-State Tournament team selection accolades, in addition to helping lead her Mankato East Cougars to three separate Big 9 conference championships. Neither her pace, nor her work ethic has slowed down since entering the college stage of her career. She started off at MSU playing 34 innings in her opening season but would follow up her freshman year by being named the Northern Sun Intercollegiate Conference (NSIC) pitcher of the week on three occasions as well as being named the NSIC pitcher of the year at the end of the season. “I love the pressure and competitive atmosphere. I live for the game on the line moments. I also love the team chemistry that needs to be there for a team to be successful,” Ries said. That pressure and competitive atmosphere she mentioned has done nothing but make her better and better when it comes to striking batters out year after year. In 2014 she threw 242 strikeouts, which was a mere five shy of breaking the MSU single season record. During her 2015 season she walloped her previous year’s stats by throwing 297 strikeouts to shatter the single season record. This year Ries has been in an even greater beast mode as she has over a hundred more than her 2014 campaign, sitting on 353 strikeouts. Showing herself to be a modest and humble person, Ries’ selfless nature through shined when she noted her coaches and teammate right away as her favorite things about playing here at MSU. “First and foremost, every single one of my teammates and coaches that I’ve been fortunate enough to build relationships with,” Ries said. Her favorite games have been her spectacular no-hitter against Central Oklahoma on March 30 of this year, along with 24-strikeout game against in 10 innings against Winona State. The 24 strikeouts is her career high, the fourth most strikeouts in a game in Division II and the most in a 10-inning game. In addition to those accomplishments, a first that Ries has brought to the MSU is that she was the first Mav softball player to be recognized as Louisville Slugger/National Fastpitch Coaches Association Division II National Pitcher of the Week. Ries is finishing up her junior year of being a mass media major and minoring in communication. To date she is sitting on a 73-30 win/loss record and has 924 strikeouts. Next year she will be entering her senior year, thus having one more season of play to attempt to meet goals that she’s set for college career. As far what those goals are Ries seems to know exactly what she wants.